The University of Louisville is a nationally-recognized academic institution, and our faculty members are eager to work with interested students and residents. We rank in the top 50 for NIH funding of Internal Medicine departments, as is evident by the amount of scholarly work produced by our residents. Stone CA Jr, Commins SP, Choudhary S, Vethody C, Heavrin JL, Wingerter J, Hemler JA, Babe K, Phillips EJ, Norton AE. Anaphylaxis after vaccination in a pediatric patient: further implicating alpha-gal allergy. J Allergy Clin Immunol Pract. 2018 Jun 15. pii: S2213-2198(18)30393-3. doi: 10.1016/j.jaip.2018.06.005. [Epub ahead of print] PubMed PMID: 29913263. Gopinathannair R, Roukoz H, Bhan A, Ravichandran A, Ahmed MM, Familtsev D, Bhat G, Cowger J, Abdullah M, Sandesara C, Dhawan R, Birks EJ, Trivedi JR, Slaughter MS. Cardiac Resynchronization Therapy and Clinical Outcomes in Continuous Flow Left Ventricular Assist Device Recipients. J Am Heart Assoc. 2018 Jun 15;7(12). pii: e009091. doi: 10.1161/JAHA.118.009091. PubMed PMID: 29907652. Giudice AL, Brewer I, Leonardi R, Roberts N, Bagnato G. Pain threshold and temporomandibular function in systemic sclerosis: comparison with psoriatic arthritis. Clin Rheumatol. 2018 Jul;37(7):1861-1867. doi: 10.1007/s10067-018-4028-z. Epub 2018 Feb 14. PubMed PMID: 29445986. Dhawan R, Gopinathannair R. Arrhythmia-Induced Cardiomyopathy: Prevalent, Under-recognized, Reversible. J Atr Fibrillation. 2017 Oct 31;10(3):1776. doi: 10.4022/jafib.1776. eCollection 2017 Oct-Nov. PubMed PMID: 29250249; PubMed Central PMCID: PMC5725757. Vahia IV, Kamat R, Vang C, Posada C, Ross L, Oreck S, Bhatt A, Depp C, Jeste DV, Sewell DD. Use of Tablet Devices in the Management of Agitation Among Inpatients with Dementia: An Open-Label Study. Am J Geriatr Psychiatry. 2017 Aug;25(8):860-864. doi: 10.1016/j.jagp.2016.07.011. Epub 2016 Aug 4. PubMed PMID: 27746070. Chaudhary D, Ahmed S, Liu N, Marsano-Obando L. Acute Liver Failure from Herpes Simplex Virus in an Immunocompetent Patient Due to Direct Inoculation of the Peritoneum. ACG Case Rep J. 2017 Feb 15;4:e23. doi: 10.14309/crj.2017.23. eCollection 2017. PubMed PMID: 28286789; PubMed Central PMCID: PMC5340723. Chaudhary D, Subhash A, Galvis J, Guardiola J. Bilateral thigh methicillin-resistant Staphylococcus aureus necrotising fasciitis in a man with newly diagnosed Human Immunodeficiency Virus (HIV). BMJ Case Rep. 2017 Jan 30;2017. pii: bcr2016218468. doi: 10.1136/bcr-2016-218468. PubMed PMID: 28137904. Srinivasamaharaj S, Salame BK, Rios-Perez J, Kloecker G, Perez CA. The role of alectinib in the treatment of advanced ALK-rearranged non-small-cell lung cancer. Expert Rev Anticancer Ther. 2016 Dec;16(12):1227-1233. Epub 2016 Nov 3. Review. PubMed PMID: 27744726. Murray DC, Oechsli M, Pinkston C, Kkloecker GH, Rios JA. P2.31: Understanding Factors Influencing Self-Referral of Patients From Resource-Limited Institutions Seeking Lung Cancer Care: Track: Supportive Care and Others. J Thorac Oncol. 2016 Oct;11(10S):S234-S235. doi: 10.1016/j.jtho.2016.08.102. Epub 2016 Sep 22. PubMed PMID: 27676564. Manair N, Arnold FW. "Encephalitis, Viral." The 5-Minute Clinical Consult 2017. Philadelphia, PA. Wolters Kluwer Health/Lippincott Williams & Wilkins. Manair N, Cavallazzi R. "Lung Abscess." The 5-Minute Clinical Consult 2017. Philadelphia, PA. Wolters Kluwer Health/Lippincott Williams & Wilkins. Manair N, Lederer ED. "Hypokalemic Periodic Paralysis." The 5-Minute Clinical Consult 2017. Philadelphia, PA. Wolters Kluwer Health/Lippincott Williams & Wilkins. Murray D, Moffett P, Hollensead S. "Pelger-Huet Anomaly." Case Studies in Hematology and Coagulation. Ed: G.Gulati. Chicago: American Society of Clinical Pathologists Press, 2017. Murray D, Abell T. "Neural Control of the Gastrointestinal System." Neuromodulation. Ed: Eliot Krames. Cambridge: Elsevier, 2018. Murray D, Abell T. "Neuromodulation for Nausea and Vomiting in Adult Patients." Neuromodulation. Ed: Eliot Krames. Cambridge: Elsevier, 2018. Pontikos, A. Abell, T. "Rapid Gastric Emptying/Pylorid Dysfunction." Motility Disorders: A Point-of-Care Clinical Guide. Ed: Eytan Barden and Reza Shaker. Springer Nature, 2017. Vethody C, Bernstein JA. "Mixed Rhinitis." Rhinitis and Related Upper Respiratory Conditions: A Clinical Guide. Ed: Jonathan Bernstein. Springer International Publishing, 2018. Gopinathannair R, Dhawan R, Trivedi J, Roukoz H, Bhan A, Ahmed MM, Bhat G, Cowger J, Slaughter MS, Ravichandran A. Cardiac Implantable Electrical Device related Procedures and Associated Complications in Continuous flow LVAD Recipients: A Multicenter Experience. Poster presented at Venice Arrhythmias; 2017, Oct 25-27; Venice, Italy. Gopinathannair R, Lakkireddy DR, Dhawan R, Murray A, Farid TA, Olshansky. Predicting Myocardial Recovery in Arrhythmia Induced Cardiomyopathy Patients: Role of Index Left Ventricular Function and Underlying Structural Heart Disease. Poster presented at 14th Annual Congress of the European Cardiac Arrhythmia Society; 2018, April; Paris, France. Gopinathannair R, Lakkireddy DR, Dhawan R, Murray A, Farid TA, Olshansky B. Arrhythmia Type and Duration on Myocardial Recovery in Patients with Arrhythmia Induced Cardiomyopathy: A Multicenter Study. Poster presented at 14th Annual Congress of the European Cardiac Arrhythmia Society; 2018, April; Paris, France. Murray D, Oechsli M, Pinkston C, Kloecker G, Rios J. Understanding Factors Influencing Self-Referral of Patients from Resource Limited Institutions Seeking Lung Cancer Care. Latin America Conference on Lung Cancer; 2016, Aug; Panama City, Panama. Pontikos, A. Abell, T.. Long Term Efficacy of Gastro Electrical Stimulation for Gastroparesis. Oral presentation at International Gastrointestinal Electrophysiology Society; 2017, May 6-9; Chicago, IL. Pontikos, A. Jayakumar, P., Abell, T.. Gastric Electrical Stimulation: Effects on Gastric Interstitial Cells of Cajal and Mast Cells. Oral presentation at International Gastrointestinal Electrophysiology Society; 2017, May 6-9; Chicago, IL. Ahmed S, Chaudhard D, Srinivasamaharaj S, Liu N, Kadle N, Mehta M, Furmanek S, Persaud A, Wiemken T, McClain C. Poorly Controlled Diabetes and Morbid Obesity Increase the Risk of Precancerous Colonic Adenoma Development in Initial Colonoscopies. Poster presented at Digestive Disease Week; 2017, May 6-9; Chicago, IL. Bhatt A, Burkes R, Karnib H, Saad M. Diffuse Alveolar Hemorrhage Secondary to Disseminated Histoplasmosis After Kidney Transplantation. Poster presented at Chest; 2016, Oct 22-26; Los Angeles, CA. Bhatt A, Nidadavolu V, Yaseen A, Menon AA, Ramirez A, Gauhar U. Mediastinal Lymphadenopathy in Homozygous Sickle Cell Disease: An Unusual Diagnosis. Poster presented at Chest; 2016, Oct 22-26; Los Angeles, CA..
Bhatt A, Ahmed S, Angus C, Maniar N, Guardiola J. Risperidone-Induced Hypothermia and Its Implications in Critically Ill Patients: A Case Series. Poster presented at Chest; 2016, Oct 22-26; Los Angeles, CA. Bhatt A, Suliman S, Nidadavolu V, El-Kersh K. Pneumorachis: An Unusual Sequela of Spontaneous Pneumomediastinum. Poster presented at American Thoracic Society International Conference; 2016, May 13-18; San Francisco, CA. Bhatt A, Mkorombindo T, El-Kersh K. Platelet Parameters and Patient Outcomes in Bacteremic and Non-Bacteremic Sepsis. Poster presented at American Thoracic Society International Conference; 2018, May; San Diego, CA. Bhatt A, Howsare MM, Gauhar U. Xanthogranulomatous Inflammation in the Lung. Poster presented at American Thoracic Society International Conference; 2017, May 19-24; Washington, D.C.
Burkes R, Mkorombindo T, Chaddha U, Bhatt A, Kubiak N, El-Kersh K, Cavallazzi R. Results of a Resident-Led Quality Improvement Project on Care of Patients with COPD in an Internal Medicine Resident Teaching Clinic. Poster presented at Chest; 2016, Oct 22-26; Los Angeles, CA. Chaudhary D, Srinivasamaharaj S, Ahmed S, Liu N, Kadle N, Mehta M, Furmaek S, Persaud A, Wiemken T, McClain C. Non-Steroidal Anti-Inflammatory Drugs Use and Relative Risk of Precancerous Colonic Polyps in Initial Colonoscopies. Poster presented at Digestive Disease Week; 2017, May 6-9; Chicago, IL. Chaudhary D, Srinivasamaharaj S, Ahmed S, Liu N, Kadle N, Mehta M, Furmaek S, Persaud A, Wiemken T, McClain C. Elucidating the Role of FIT and FOBT in Detecting Precancerous Colonic Adenomas in Initial Colonoscopies. Poster presented at Digestive Disease Week; 2017, May 6-9; Chicago, IL. Chaudhary D, Srinivasamaharj S, Liu N, Ahmed S, Kadle N, Furmanek S, Persaud A, Wiemken T, McClain C. Modelling the Development of Precancerous Adenomas: Utility of Social History, Comorbidities and FOBT/FIT Testing. Poster presented at World Congress of Gastroenterology at American College of Gastroenterology; 2017, Oct 15-18; Orlando, FL. Dhawan R, Olshanksy B, Murray A, Farid TA, Lakkiredy DR, Gopinathannair R. Predicting Myocardial Recovery in Arrhythmia Induced Cardiomyopathy Patients: Role of Index Left Ventricular Function and Underlying Structural Heart Disease. Poster presented at Heart Rhythm Society 39th Annual Scientific Sessions; 2018, May 9-12; Boston, MA. Dhawan R, Angus CR, Pearce RA, Bitar A, Guinn B, Lakkireddy D, Olshansky B, Gopinathannair. Impact of Arrhythmia Duration and Index Left Ventricular Ejection Fraction on Recovery of Left Ventricular Function in Patients with Arrhythmia-Induced Cardiomyopathy. Poster presented at American College of Cardiology 66th Annual Scientific Session and Expo; 2017, Mar 17-19; Washington, D.C.
Dhawan R, Sultan A, Fernando R. An Unusual Cause of Aortic Regurgitation: Incremental Value of CMR in Diagnostic Workup. Poster presented at Proceeding from the 20th Annual SCMR Scientific Sessions; 2017, Feb 1-4; Washington, D.C.
Dhawan R, John A, Fernando R. Ruptured Sinus of Valsalva Aneurysm: Incremental Value of Cardiac Magnetic Resonance Imaging in Diagnosis and Management. Poster presented at the Society for Cardiovascular Magnetic Resonance (SCMR); 2017, Feb; Washington D.C.
Dhawan R, Kandasamy VV, Fernando R. Non-Malignant Superior Vena Cava Syndrome and Utility of Gadofosveset in Imaging of Superior Vena Cava and Bypass Grafts. Poster presented at the Society for Cardiovascular Magnetic Resonance (SCMR); 2017, Feb; Washington D.C.
Dhawan R, Patel S, Fernando R. Case of Apical Hypertrophic Cardiomyopathy Presenting with Ventricular Fibrillation Arrest. Poster presented at the Society for Cardiovascular Magnetic Resonance (SCMR); 2017, Feb; Washington D.C.
Gopinathannair R, Trivedi J, Bhan AK, Ravichandran A, Ahmed M, Bhat G, Cowger J, Abdallah M, Sandesara C, Dhawan R, Vijayakrishnan R, Slaughter M, Roukoz H. Atrial Arrhythmias and Clinical Outcomes in Continuous Flow LVAD Recipients: A Multicenter Analysis. Poster presented at Heart Rhythm Society 39th Annual Scientific Sessions; 2018, May 9-12; Boston, MA. Gopinathannair R, Dhawan R, Vijayakrishnan R, Roukoz H, Bhan A, Ravichandran A, Ahmed MM, Bhat G, Cowger J, Abdullah M, Sandesara C, Trivedi JR, Slaughter MS. Amiodarone use and outcomes in Continuous Flow LVAD patients. Poster presented at Heart Rhythm Society 38th Annual Scientific Sessions; 2017, May 10-13; Chicago, IL. Henry, L. Ahmed, S. Pontikos, A. Dryden, G.. Computed Tomography Colonography: The Robley Rex VAMC Experience. Poster presented at American College of Gastroenterology (ACG); 2016, Oct 14-19; Las Vegas, NV. Maniar N, Cavallazzi R. Predictors Of Bacteremia From The Complete Blood Count In Patients In The Intensive Care Unit. Poster presented at American Thoracic Society International Conference; 2018, May 18-23; San Diego, CA. Maniar N, Clarke C, McDaniel E, Smith JS, El-Kersh K. Characteristics and Outcomes Of Pulmonary Hypertension Patients In A Tertiary Referral Center. Poster presented at American Thoracic Society International Conference; 2017, May 19-24; Washington, D.C.
Murray D, Mandadi, M. Understanding Barriers to Receiving Genetic Testing After Referral. Poster presented at ASCO; 2017, June; Chicago, IL. Pontikos, A. Jaafar, I. Kadle, N. Omer, E. Stocker, A. McElmurray, L. Miller, E. Hughes, R. Abell, T.. Long Term Efficacy of Gastro electrical Stimulation for Gastroparesis. Poster presented at Digestive Disease Week; 2017, May 6-9; Chicago, IL. Pontikos, A. Abell, T.. Long Term Efficacy of GES for Gastroparesis. Oral Presentation at: UVA Annual Conference of Liver Disease and Gastroenterology; 2017, June; Charlottesville, VA.
Price JD, Kim RY, Maniar N, Rahman T, Kothari Y, Pearce R, Cavallazzi, R. Extended Spectrum Beta-Lactamase Infection: Determining Risk Factors For Mortality. Poster presented at American Thoracic Society International Conference; 2017, May 19-24; Washington, D.C.
Rahman T, Cavallazzi R, Price JD, Kim RYH, Kothari Y, Bhatt A, Maniar N, Pearce R. Identifying methicillin resistant Staphylococcus aureus (MRSA) pneumonia risk factors. Poster presented at American Thoracic Society International Conference; 2017, May 19-24; Washington, D.C.
Roukoz H, Sathnur N, Bhan AK, Ravichandran A, Ahmed MM, Bhat G, Cowger J, Abdullah M, Dhawan R, Trivedi J, Slaughter MS, Gopinathannair R. Continued CRT versus Turning Off LV Lead After Left Ventricular Assist Device Implant: A Multicenter Experience. Poster presented at Heart Rhythm Society 39th Annual Scientific Sessions; 2018, May 9-12; Boston, MA. Srinivasamaharaj S, Chaudhary D, Liu N, Ahmed S, Kadle N, Mehta M, Furmanek S, Persaud A, Wiemken T, Krueger K, McClain C. Association of Vitamin D Deficiency and Pre-cancerous Colonic Polyps in Initial Colonoscopies. Poster presented at Digestive Disease Week; 2017, May 6-9; Chicago, IL. Srinivasamaharaj S, Chaudhary D, Kadle N, Liu N, Ahmed S, Furmanek S, Persaud A, Wiemken T, McClain C. Association of Smoking, Alcohol Use, COPD, and Colorectal Adenomas in Initial Colonoscopies. Poster presented at World Congress of Gastroenterology at American College of Gastroenterology; 2017, Oct 15-18; Orlando, FL. Ahmed M, Chaudhary D, Dhawan R, Sharpe T. Severe Symptomatic Hypercalcemia induced by elevated Parathyroid Hormone-related Protein in Multiple Myeloma. Poster presented at the Kentucky American College of Physicians Meeting; 2016, Oct 5; Lexington, KY.
Bhatt A, Sharpe T. Lupus Psychosis: A Case Report. Poster presented at the Kentucky American College of Physicians Meeting; 2016, Oct 5; Lexington, KY.
Bhatt A, Murthy N, Dhawan R, Sharpe T. Group B Streptococcus Endocarditis. Poster presented at the Kentucky American College of Physicians Meeting; 2016, Oct 5; Lexington, KY.
Bhatt A, Mehta M, Patel C, Marsano LS. Underlying NASH may increase the risk of allopurinol induced liver failure: A case study. Poster presented at the Kentucky American College of Physicians Meeting; 2015, Oct 5; Lexington, KY. Brewer I, Ravenell R. Methotrexate and Leflunomide Side Effect Monitoring: a Retrospective Study of Veterans Affairs Patients. Poster presented at the Kentucky American College of Physicians (ACP) Meeting; 2017, Sept 29; Louisville, KY.
Bills, GS. Total Eclipse of the Heart: a Case of Polymyositis. Oral Presentation presented at Kentucky ACP Associates Conference at Shakertown; 2017, Mar 28; Harrodsburg, KY.
Chaudhary D, Dhawan R, Srinivasamaharaj S, Juan Guardiola. Clostridium Difficile, new and improved: North American Pulsed-field Gel Electrophoresis Type 1 Strain. 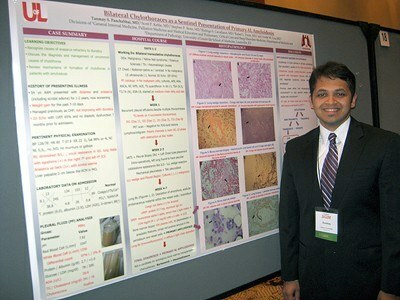 Poster presented at the Kentucky American College of Physicians Meeting; 2016, Oct 5; Lexington, KY.
Chaudhary D. It is just a leg pain: Methicillin Resistant Staphylococcus Aureus necrotizing fasciitis. Oral Presentation presented at Kentucky ACP Associates Conference at Shakertown; 2017, Mar 28; Harrodsburg, KY.
Chaudhary D, Srinivasamaharaj S, Dhawan R, Sharpe T. Gastric Outlet Obstruction – sign of malignancy? Poster presented at the Kentucky American College of Physicians Meeting; 2016, Oct 5; Lexington, KY.
Darji M, Smith C. A Case of Multiple Endocrine Neoplasia Type 1. Poster presented at the Kentucky American College of Physicians (ACP) Meeting; 2017, Sept 29; Louisville, KY.
Dhawan R, Kandasamy VV, Vijayakrishnan R, Gopinathannair R. Impact of Coronary Revascularization in Management of Ventricular Tachycardia in Left Ventricular Assist Device Patients. Poster presented at the Kentucky- American College of Cardiology 13th Annual Meeting and Scientific Session; 2017; Louisville, KY.
Dhawan R, Angus CR, Pearce RA, Bitar A, Guinn B, Lakkireddy D, Olshansky B, Gopinathannair R. Impact of Arrhythmia Duration and Index Left Ventricular Ejection Fraction on Recovery of Left Ventricular Function in Patients with Arrhythmia-Induced Cardiomyopathy. Poster presented at the Kentucky- American College of Cardiology 13th Annual Meeting and Scientific Session; 2017; Louisville, KY.
Dhawan R, Angus CR, Pearce RA, Bitar A, Gopinathannair R. Impact of Long-term Alcohol Use on Degree of Improvement in Left Ventricular Function in Patients with Arrhythmia Induced Cardiomyopathy. Poster presented at Research! Louisville; 2016, October; Louisville, KY.
Dhawan R, Gopinathannair R. Insight into Potentially Reversible Cardiomyopathies. Oral Presentation presented at Kentucky ACP Associates Conference at Shakertown; 2017, Mar 28; Harrodsburg, KY.
Dhawan R, Martin D, Moffett B. Does the Diuretic Dose Need to be Increased? Think Twice, Be Wise! Poster presented at the Kentucky American College of Physicians (ACP) Meeting; 2017, Sept 29; Louisville, KY.
Dhawan R, Bhatti S, Kelsey N, Mitchell CK. Heart Failure with Preserved Ejection Fraction is Sometimes Not an Easy Diagnosis. Poster presented at the Kentucky American College of Physicians (ACP) Meeting; 2017, Sept 29; Louisville, KY.
Dhawan R, Chaudhary D, Srinivasamaharaj S, Sharpe T. Association Between Aortic Stenosis and Arteriovenous Malformations- Controversies Persist. Poster presented at the Kentucky American College of Physicians Meeting; 2016, Oct 5; Lexington, KY.
Dhawan R, Srinivasamaharaj S, Jalil BA, Guardiola JJ. Hemopericardium Leading to Cardiac Tamponade as a Consequence of Anticoagulation. Poster presented at the Kentucky American College of Physicians Meeting; 2016, Oct 5; Lexington, KY.
Dhawan R, Ahmed M, Chaudhary D, Bhatt A, Workman. Rare Cause of Fungemia and Bacteremia in an Immunocompetent Patient. Poster presented at the Kentucky American College of Physicians Meeting; 2016, Oct 5; Lexington, KY.
Hussaini S, Sharpe T. Priapism as an Initial Presentation in CML. Poster presented at the Kentucky American College of Physicians (ACP) Meeting; 2016, Oct 5; Lexington, KY.
Kelsey N, Bhatti S, Dhawan R, Brown J. Herpes Zoster leading to falls in the elderly: A Viral Tale of Orthostatic Hypotension. Poster presented at the Kentucky American College of Physicians (ACP) Meeting; 2017, Sept 29; Louisville, KY.
Maniar N, Bhatt A, Burk M, Bishop L, Kircher A, Koch J. Attendance Guidelines and Online Lectures: Impact on Internal Medicine Resident Didactic Lecture Attendance. Poster presented at the Kentucky American College of Physicians Meeting; 2016, Oct 5; Lexington, KY.
Martin D, Dhawan R, Moffett B. The Pain of Cocaine: Intake Results in Kidney Ache. Poster presented at the Kentucky American College of Physicians (ACP) Meeting; 2017, Sept 29; Louisville, KY.
Murray D, Kloecker G. Case of a Lung Cancer Patient with Dyspnea and Facial Plethora. Poster presented at the Kentucky American College of Physicians (ACP) Meeting; 2016, Oct 5; Lexington, KY.
Murray D, Kubiak N. Bandemia, Hematological Malignancy or Congenital Abnormality. Poster presented at the Kentucky American College of Physicians (ACP) Meeting; 2016, Oct 5; Lexington, KY. Shine A, Dhawan R, Kim R, El-Kersh K. Acute Hypercapnic Respiratory Failure Secondary to Dermatomyositis. Poster presented at the Kentucky American College of Physicians (ACP) Meeting; 2017, Sept 29; Louisville, KY. Shine A, Dhawan R, Kim R, El-Kersh K. Hemosuccus Pancreaticus and Spontaneous Hemoperitoneum- A Rare Dual Diagnosis. Poster presented at the Kentucky American College of Physicians (ACP) Meeting; 2017, Sept 29; Louisville, KY.
Smith, WT, Shine A, Dhawan R, El-Kersh K. A Rare Cause of Hypovolemic Shock in the Intensive Care Unit: Spontaneous Rectus Sheath Hematoma. Poster presented at the Kentucky American College of Physicians (ACP) Meeting; 2017, Sept 29; Louisville, KY.
Srinivasamaharaj S, Chaudhary D, Dhawan R, Sharpe T. Chemotherapy-induced Atypical Hemolytic Uremic Syndrome. Poster presented at the Kentucky American College of Physicians (ACP) Meeting; 2016, Oct 5; Lexington, KY.
Srinivasamaharaj S, Chaudhary D, Dhawan R, Casper B. Caffeine and Malignant Hyperthermia: Is It Worth the Risk? Poster presented at the Kentucky American College of Physicians (ACP) Meeting; 2016, Oct 5; Lexington, KY.
Vega Velez J, Patel S, Parker F, Kubiak N. Chronic Opioid Therapy Documentation Plan. Poster presented at the Kentucky American College of Physicians (ACP) Meeting; 2017, Sept 29; Louisville, KY.
Vethody C, Sharpe T. B12 Deficiency causing Thrombocytopenia. Poster presented at the Kentucky American College of Physicians (ACP) Meeting; 2017, Sept 29; Louisville, KY.
Vethody C, Eid N, Morton RL, Vancleave B, Bickel S. Silent Airflow Obstruction and Air Trapping on Discharge in Children Hospitalized with Asthma. Poster presented at Eastern Allergy Conference; 2017, June; Palm Springs, FL.